“Fight Supremacy 2.0” led the counter protest. Students participated in demonstrations on Boston Common. 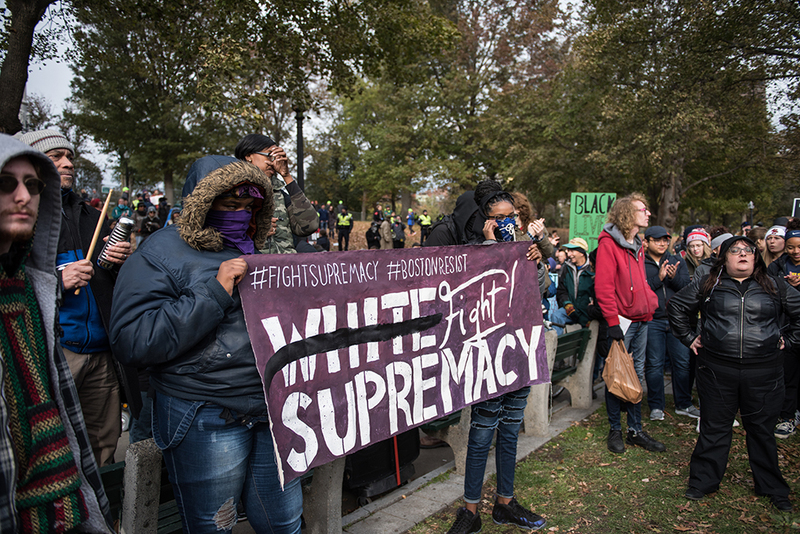 Students held signs in demonstrations on Boston Common. Emerson students marched in small groups in the “Fight Supremacy 2.0” protest against the “Rally for the Republic” gathering in Boston Common on Saturday, Nov. 18, at noon. “Rally for the Republic,” was organized by conservative groups Resist Marxism and Boston Free Speech was centered at bandstand in the Boston Common. Coalitions such as Black Lives Matter and Antifa groups attended the counter protest. An officer at the event, could not estimate the numbers attending either protest. However, the Boston Globe estimated about 100 participants in the free speech rally and 1,000 counter protesters. Similar to the rally in August, which led to 27 arrests, the event was solely meant to focus on the concept of exercising free speech. Resist Marxism posted a statement on their Facebook page regarding their intentions for Saturday’s rally on November 15. “The organizers of this peaceable assembly seek to exercise our First Amendment rights, celebrate our country that we ALL share, have some patriotic speeches, and go home,” the statement read. Isabella Guerrero, Alejandra Duque, and Navin Bose are three Emerson freshman who were participating in the event. The group spent about an hour standing among the crowd of counter protesters. “It’s also really great to see how many people came out and supported a movement that’s against racism and fascism and just for all the beliefs we share,” Bose said. Only three arrests were made, two for disorderly conduct and one for assaulting a police officer. In a statement, Boston Police Commissioner William Evans said the event “couldn’t have gone much better” from a public safety perspective. “There’s no point in protesting if you’re gonna do it violently,” Guerrero said. Two other Emerson Freshmen, Maddie Kerr and Frank Frascella, joined the side of the counter protesters but said they were there as mainly observers instead of activists. “There’s a lot of people who aren’t very quick to listen to others perspectives,” Kerr said. Numerous signs, including “Silence is Violence” and “Fight Supremacy,” were held high throughout the counter protest, which was separated from the “Rally for the Republic” by barricades. Individuals and groups with microphones gave brief speeches and chants to rally the crowd. Freshmen Rupa Palla and Maysoon Kahn arrived near the end of the event. “I heard someone say, ‘if you’re used to privilege, equality is gonna feel like oppression’ and that does not feel any more relevant than right now,” Khan said. Kahn, being from the Boston area, attended the first counter protest in August. She described this month’s demonstration as more tame, giving credit to the Boston Police for ensuring safety for everyone. “[Emerson College] had a lot of like cautions beforehand, warning students weeks before and I think that’s a really good thing a college can do,” Palla said. The most recent email regarding the protests was sent a day before. Lee Pelton wrote about the potential numbers of protests the demonstrations might attract, and the impact this might have around campus due to close proximity. The email described the security precautions taking place on campus to ensure the safety of Emerson students. Emerson released a statement on the demonstrations Saturday regarding the school’s response and management to the events. “The College activated its Emergency Response Team on Saturday and monitored the events on the common throughout the day Saturday, providing updates on the College website. We appreciate the patience and understanding of the College community. The safety and security of faculty, students and staff is our utmost priority,” wrote Director of Media Relations Michelle Gaseau via email. The free speech event came to a close around 2:30 p.m.
“As long as we are fighting together for a united cause to end racism, I think that’s the biggest thing people here can do,” Palla said.